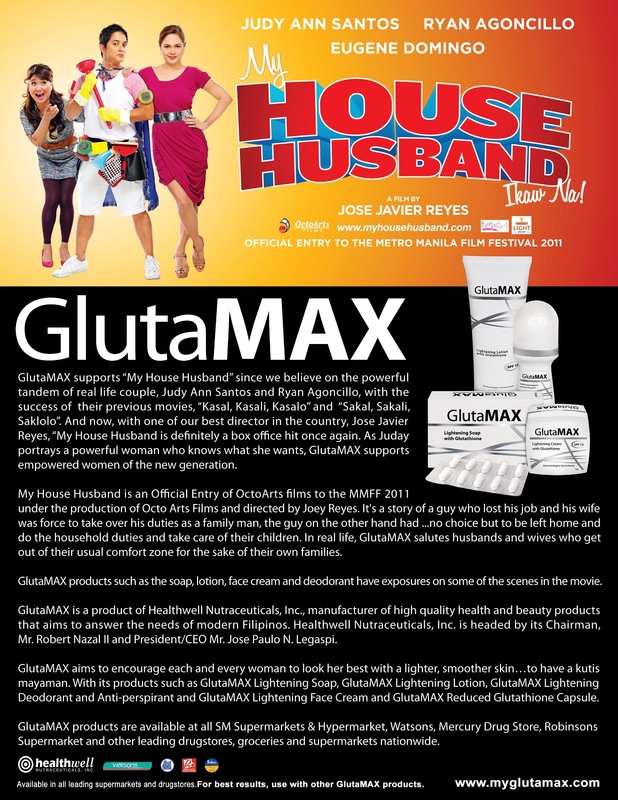 GlutaMAX supports “My House Husband” since we believe on the powerful tandem of real life couple, Judy Ann Santos and Ryan Agoncillo, with the success of their previous movies, “Kasal, Kasali, Kasalo” and “Sakal, Sakali, Saklolo”. And now, with one of our best director in the country, Jose Javier Reyes, “My House Husband is definitely a box office hit once again. As Juday portrays a powerful woman who knows what she wants, GlutaMAX supports empowered women of the new generation. My House Husband is an Official Entry of OctoArts films to the MMFF 2011 under the production of Octo Arts Films and directed by Joey Reyes. It’s a story of a guy who lost his job and his wife was force to take over his duties as a family man, the guy on the other hand had …no choice but to be left home and do the household duties and take care of their children. In real life, GlutaMAX salutes husbands and wives who get out of their usual comfort zone for the sake of their own families. GlutaMAX products such as the soap, lotion, face cream and deodorant have exposures on some of the scenes in the movie. GlutaMAX is a product of Healthwell Nutraceuticals, Inc., manufacturer of high quality health and beauty products that aims to answer the needs of modern Filipinos. Healthwell Nutraceuticals, Inc. is headed by its Chairman, Mr. Robert Nazal II and President/CEO Mr. Jose Paulo N. Legaspi. GlutaMAX aims to encourage each and every woman to look her best with a lighter, smoother skin…to have a kutis mayaman. With its products such as GlutaMAX Lightening Soap, GlutaMAX Lightening Lotion, GlutaMAX Lightening Deodorant and Anti-perspirant and GlutaMAX Lightening Face Cream and GlutaMAX Reduced Glutathione Capsule. GlutaMAX products are available at all SM Supermarkets & Hypermarket, Watsons, Mercury Drug Store, Robinsons Supermarket and other leading drugstores, groceries and supermarkets nationwide.